Swiss watch giant Tag Heuer has officially announced its second Android Wear smartwatch, the Connected Modular 45. Like the original Connected, Tag has teamed up with Intel and Google to make the second-generation connected timepiece. Unlike Tag's first smartwatch, the Modular 45 carries the prestigious 'Swiss Made' label, as it has been assembled in the Tag Manufacture in La Chaux-de-Fonds, Switzerland. If you're thinking about whether to make the upgrade or make your first Android Wear smartwatch purchase, here's our breakdown of the essential details you need to know about Tag's new Connected smartwatch. The 45mm watch will be available with titanium, ceramic and 18K rose gold finishes and, as speculated, will feature what Tag is describing as a modular design. That means you'll be able to change the electronic watch with a traditional mechanical Tag module, such as the Calibre 5 or the chronograph Tourbillon Heuer 02-T. You'll also be free to swap out the lugs, the straps and the buckle. In all, Tag says there are 56 different versions available at launch. This is 'modularity' aimed very precisely at luxury watch wearers. It's a system which addresses the fact that this group might not want to wear a smartwatch 24/7. Tag isn't interested in adding more functions and sensors as we've seen with other experiments in smartwatch modularity. Instead it's looking for a watch system which sees its loyal customers owning both a smartwatch and a mechanical/chronograph module. Another piece of good news on the design front is that it's water resistant to 50 metres so you can take it for a swim in the pool. It's undeniably a smartwatch built for men, but Tag's CEO Jean-Claude Biver has confirmed that a Tag Heuer Connected Modular for women is launching in October and will feature a smaller, 39.45mm design. On the screen front, Tag is changing things up from the original and now using a 1.39-inch, 400 x 400 AMOLED touchscreen display. It's set behind sapphire crystal glass with a 287ppi matching the cheaper Asus ZenWatch 3 for screen quality specs. There's also a command crown to offer a physical alternative to interacting with the watch. Android Wear 2.0 will of course be on board as well, which is compatible with Android smartphones running on Android 4.3 or higher and the iPhone 5 and above running iOS 9 or later. It should bring all the new goodies from Google's latest software update including access to the Google Play Store from the watch, improved Google Fit support and more customisable watch faces. Tag is offering 30 new exclusive watch faces and a companion Studio app to create/personalise your own that will be available for Android devices originally - iOS is coming, we're promised. In terms of connected smarts, there's an Intel Atom Z34XX processor powering performance, 4GB of storage memory and a 410mAh battery that should get you up to 25 hours of play time. It should take just under 2 hours to power back up when you hit 0% battery. There's also built-in Wi-Fi and GPS to give it more standalone appeal, and NFC to make payments from the wrist through Android Pay. There's additional sensors aplenty on board as well including an accelerometer, gyroscope, tilt detection sensor, vibrations/ haptics engine and an ambient light sensor. It also features a small water-resistant microphone to tap into Google's Assistant and voice search support through Android Wear. 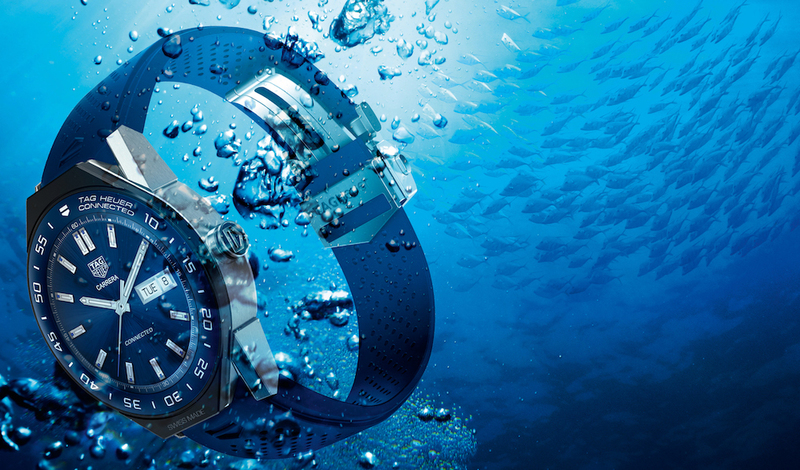 All in all, that makes it a much more feature-packed watch than the first Tag Heuer Connected. So this is the big question; How much does the Tag Heuer Connected Modular 45 cost? It's on sale now from $1,650 and it's a limited edition of 15,000 models. So it's a bit more expensive than the original Connected. A Deluxe box set including the smartwatch (in grade 5 titanium, with titanium lugs and brown natural leather strap), along with a Heuer-02T tourbillon mechanical module plus an additional black rubber strap will be available for a total price of $17,000.